A resin-made miniature elephant with a silver finish and a small slit for place card or photo, this place hard colder will grace every table it's at. The elephant measures approximately 1 5/8 inches by 1 3/4 inches by 1 1/8 inches. 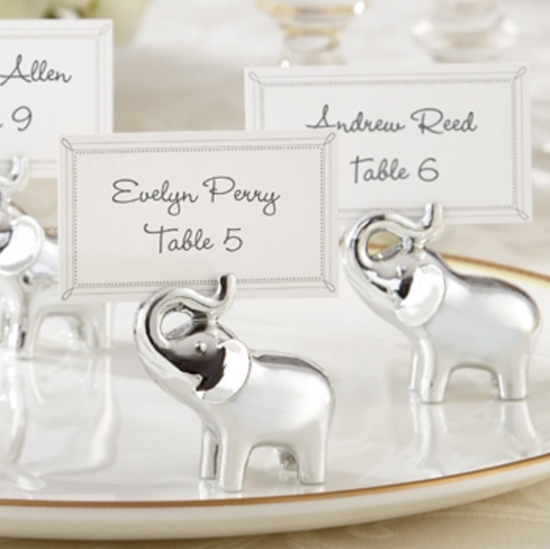 The Silver Elephant of Blessings Place Card Holders are sold in a set of four, and come with included place cards. The presence of place card holders at the table is a must at every wedding reception, and if you’re going to get one, it might as well be as ornate as the Silver Elephant of Blessings Place Card Holder. Not only does the cute and shiny little elephant serve its function, it also decorates your table while in a unique fashion that will draw attention to the rest of your venue’s decor.